Background: Molecular genotyping of ABO blood group system has identified more than 60 “O” group alleles based on the single-nucleotide polymorphisms present in the ABO gene. Heterogeneity of O group alleles has been observed in various countries from South America, Europe, Middle East, and Asia. India is a vast country with more than 1300 million population which is divided into various ethnic and tribal groups. However, very little is known about the heterogeneity of O alleles in Indians. Materials And Methods: A total of 116 O group individuals from the mixed population of Mumbai, India, were enrolled in the present study. DNA was extracted using the standard phenol–chloroform method. The exons 6 and 7 of the ABO gene were genotyped by polymerase chain reaction-single-strand conformation polymorphism and/or DNA sequencing. The genotyping results were compared with our earlier findings. Results And Discussion: Overall, ten different genotypes were identified. Three rare alleles, namely, O05, O11, and O26 were seen in the mixed group category. These results suggest that there is an internal heterogeneity in the mixed group while Dhodias and Parsis, the groups which were screened earlier, seem to be more homogenous groups. An important piece of information emerges out from this study, that is, O01O02 genotype is expressing some selective force in population groups screened in India as well as many other groups worldwide. Conclusion: In the future, molecular genotyping of the ABO blood group system among different ethnic and tribal Indian groups would help in generating data to fill up the gaps in the molecular ABO map of the world. The ABO blood group system was discovered by Karl Landsteiner in 1900. This is the first human genetic system to be applied to the study population genetics of various population groups. The gene encoding ABO blood groups is located on chromosome 9 at position 9q34.1-q34.2 spanning over 18 kb of genomic DNA. It comprises of seven exons with their size ranging from 28 to 688 bp. The last two exons, namely, 6 and 7 encode for about 77% of the glycosyltransferase and 91% of catalytically active protein part. Among the ABO alleles, A101 is considered as the reference allele and the other alleles show the sequence variations as compared to this allele. B101 allele differs from it by seven nucleotide polymorphisms. Of these, three are silent alterations while four alterations result in four amino acid changes. The O group alleles are considered as the null alleles which occur as the most frequently encountered among the modern humans and encode for a catalytically inactive protein. Among these, the most frequent human O alleles are O01 and O02, which differ in exon 6 and exon 7 by nine nucleotides but share one common deletion of G at position 261. The O02 (earlier called as O1 variant) was first reported in a cancer cell line. Olsson and Chester found this variant in Swedish donors accounting for about 40% of O alleles while Ogasawara et al. detected this allele in 50% of all O alleles from Japan., Apart from these, several variant alleles which carry nt 261(-G) deletion have been reported. They are clubbed together under the heading as “deletional O group alleles.” The second group of O alleles is known as “nondeletional group.” The first allele in this group, namely, the O03 (O2) was detected by Grunnet et al. in Danish population and its frequency was found to be 3.7% of O alleles. In this group, the consensus guanosine at position 261 is present. Hence, this allele encodes a full-length protein. However, mutation at position 802 (Gly268Arg) plays a crucial role in inactivation of the enzymatic property. A handful of reports on the distribution of O alleles are available from South America, Africa, Europe, Middle East, and Asia.,,,,,,,,,,,,,,, These studies illustrate lot of heterogeneity among the O alleles. The O01 and O02 are the most common alleles seen in these studies. In fact, some of the Amerindian groups have revealed the presence of these two alleles only. Apart from this, several rare O alleles have been identified in different population groups from various continents. In the present study, we report the heterogeneity at molecular level among the O alleles in the diverse Indian population. A total of 116 blood samples were collected from O group individuals from mixed population of Mumbai. For data analysis, data from 34 Parsis, 34 Dhodias, and 26 mixed group individuals which were a part of our earlier work were also included in this study. In fact, this is the only report available in India on O alleles which was published by our group earlier. The O group phenotype was confirmed by the standard serological methods using monoclonal antisera (Ortho Diagnostic, USA). Molecular genotyping for determination of the ABO alleles was performed by PCR-single-strand conformation polymorphism (SSCP) method as described earlier by our group. Briefly, three fragments covering exon 6 and 7, amplified in separate reactions, were pooled and denatured in the presence of denaturing dye at 95°C for 5 min. They were cooled immediately and electrophoresed on a 10% polyacrylamide gel electrophoresis gel at 400V for 2 and 1/2 h. The products were then visualized by silver staining method. The molecular genotype of the O group samples was then determined by comparing their SSCP patterns with a catalog of SSCP patterns of known genotypes developed at our center. 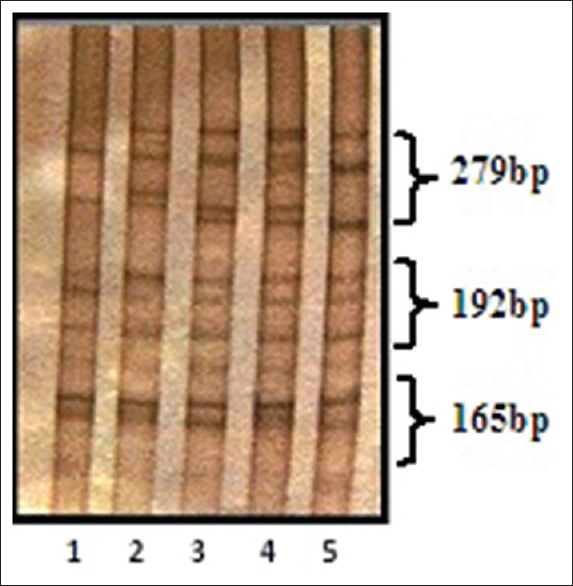 Samples which showed altered banding patterns in SSCP were further characterized by DNA sequencing as described by Cai et al., 2008. A total of 116 O group individuals from mixed group were analyzed. [Figure 1] depicts the SSCP patterns of various O group individuals showing the presence of common O alleles. As mentioned earlier, the molecular genotypes were directly predicted by comparing the SSCP patterns with those present in the catalog which was prepared earlier at our center. [Table 1] shows the distribution of various genotypes seen in the mixed group. For comparison, the data from our earlier report is also included. Ten different genotypes were identified among the mixed group while five genotypes among the Parsis and only three genotypes among Dhodias were identified. Four atypical patterns from mixed group that were not matching with the patterns of the catalog were observed. DNA sequencing was carried out in these samples. Three alleles, namely, O05, O11, and O26 were identified in these samples. The first allele identified was O05 which is a deletional O allele and also showed 297A>G polymorphism. The following polymorphisms: 261delG, 297A>G, 542G>A, 646T>A, 681G>A, 771C>T, and 829G>A in exons 6 and 7 confirmed O11 allele while a deletional O allele with the presence of 768C>A alteration confirmed O26 allele. The O01O01 was the most common genotype found among mixed group whereas O01O02 was found as the most common genotype among the Dhodias and the Parsis. [Table 2] shows the frequencies of various O alleles detected in the present study as well as our previous report. Among Parsis and Dhodias, only three and two O alleles were identified, respectively. While the frequency of O01 varied in the range of 0.5211–0.5357, the same for O02 allele varied in the range of 0.3521–0.4265. [Table 3] reveals the Chi-square values obtained for different genotypes in the study. It is surprising to see that the O01O02 genotype, which is the most common genotype in all the groups, shows significant Chi-square values as the observed numbers being higher than the expected numbers. [Table 4] shows the comparison on the gene frequencies of O01 and O02, the most common O alleles among various population groups screened from different countries in the world. Aborigines from South America show the very high frequencies of these alleles. In many populations, these are the only two O alleles detected. Lot of variation is seen in the frequency of these alleles in the world population. The third row of this table represents Chi-square values for O01O02 genotype in different populations. It shows that out of 26 population groups, only 10 groups show statistically nonsignificant χ2 values. In other words, in 16 groups O01O02 genotype did not follow Hardy–Weinberg equilibrium. In our study too, the O01 and O02 have been the most common alleles. Frequency of O01 varied among Parsis, Dhodias, and mixed group individuals (0.5588, 0.5735, and 0.5211, respectively). This frequency is comparable to the other Middle East and Asian populations as well as in some populations from South America and Europe.,,,, The O02 allele was more frequent among the Dhodias (0.4265) as compared to the Parsis (0.3971) and the mixed group (0.3521). A total of six O group alleles have been identified in the present study. Dhodias, a tribal group from Gujarat, revealed the presence of two alleles found usually among the aborigines from South America. Similarly the Parsis, a group migrated from Iran, showed the presence of only three alleles, namely, O01, O02 the common alleles, and O03, a nondeletional allele with a frequency of 0.0441. The less common alleles were identified among the mixed group individuals. There are very few reports in literature describing the heterogeneity of O alleles.,,, If we see the number of O alleles in these studies, the O01 and O02 which are the deletional O alleles are the most common ones occurring with variable frequencies. Apart from these two, some rare or variant O alleles are also seen. Among Asians, Fukumori et al. screened Japanese population and reported the presence of only two O alleles, namely, O01 and O02. However, Ogasawara et al. identified four alleles (O04, O05, O06, and O07) being reported for the first time along with O01 and O02. Yang et al. screened Chinese Han population from Guangdong Province of China and found that O01 and O02 accounted for almost 97% of all O alleles while six variant O alleles including O05 were identified., Interestingly, O01O02 genotype was within the Hardy–Weinberg equilibrium in this series. Zhu et al. reported that O01 and O02 accounted for almost 98% of all O alleles among Han population from Eastern mainland of China. O05, O07, O50, and O61 were the less common alleles identified in this study. Apart from O01 and O02, Tsai et al. did not find any rare allele among Koreans. In Kuwait, Yip et al. found different set of rare alleles (O59, O09, O58, O44, and O48). In the present study, three less common alleles, namely, O05, O11, and O26 have been identified. O05, a recombinant allele with O01 and O02 being parental alleles was found in two individuals, among which one was homozygous. Earlier, O26 was detected among Basques from France and Spain. Later on, it was detected among Germans and in the present study, detected among the Indians. O11 allele was seen in three individuals in heterozygous condition. Among these, one individual (mixed group population) belonged to Sindhi, a population group migrated from the Sindh province of the present day Pakistan. This case is a part of our earlier report. Communities of the remaining two individuals were not known. Earlier this, allele accounted for 4% of all O alleles in Cayapas from Ecuador, 12% in Ayamaras from Bolivia, and as high as 43% in Amerindians from Brazil. Interestingly, this allele has got 542G > A polymorphism which has been considered as ancestry informative marker among the native Americans. Olsson et al. suggested that this alteration must have arisen before the man migrated to America. O05 is a recombinant allele was first detected by Ogasawara et al (1996) among Japanese., This was also detected among the Han population from China., Recently, Umbria et al. detected all the three above mentioned less common alleles among Spanish and Polish groups from Spain and Poland, respectively. In spite of this, it can be argued that rare alleles are not population specific because many population groups are not screened and data from only 20–25 population groups from all over the world is available today. These groups are very specific groups such as Basques, Akanes, and Berbers and on the other hand, broad groups such as Kuwaitis, Jordanians, and some Europeans. It is known that in the ABO blood group system the gene/allele frequency depends on a combination of various forces such as selection against infectious diseases, namely, plague or cholera, genetic drift, and founder effect in isolated population groups. It has been argued that blood group O provides a selective advantage against severe malaria., It is also presumed that O group has arisen in Africa before the migration of early humans. This is supported by the analysis of two male Neanderthals who showed nt 261(-G) deletion. Severe malaria must have resulted in the death of millions of people every year and thus in the selection of survival genes, namely, O group, must have occurred. On development of techniques for molecular genotyping, phylogenetic network analysis was carried out which led to the conclusion that the alleles O01, O04, and O05 may belong to the same evolutionary lineage as A group whereas the alleles O02, O06, and O07 may belong to another lineage that differs from A and B. Roubinet et al., after analyzing 814 O chromosomes, reported that O02 is the most ancient allele and that this allele would have undergone many mutations without any functional impact because it is just a null allele. All other alleles share a specific deletion (261delG) with O02, so it must be more recent and could have been transferred from O02 to the O01 lineage either by recombination between O02 and A101 or by gene conversion between O01 and O02. Calafell et al., after extensive analysis, concluded that the specific deletion giving rise to O null allele is likely to have occurred at least three times in human evolution giving rise to three distinct lineages, namely, O01, O02, and O09. Thus, O01 becomes a recombinant O allele even though we consider it as a reference allele for O group. In a context of balancing selection, in which the null alleles may have been selected for, O01 may have been driven to high frequencies at the expense of A and B alleles but not of the preexisting O02. This may partially explain why the two very different alleles may coexist at a high frequency. In the present study, we tried to see whether O01O02 genotype is in the Hardy–Weinberg equilibrium in various population groups from different countries. In several groups, it is not in equilibrium. The evolutionary history suggests that balancing selection has maintained a polymorphism at the ABO locus for millions of years and the variants which occur at higher frequencies are important from the fitness point of view. The mechanism of balancing selection is not yet clear. Frequency-dependent selection and heterozygote advantage are one of the two possibilities. In conclusion, after analyzing the data on O alleles from various populations in the world screened so far, important information emerges out and that is O01O02 genotype is affected by some unknown selective force. This is evident from the fact that expected values in population groups are less than the observed values in case of O01O02 genotype. However, more data from different population groups residing in different geographical areas and ecological settings are required before we reach to conclusions. Similarly, in the Indian context, many more population groups from different states of India need to be screened to get an idea about distribution of various O alleles. Yamamoto F, McNeill PD, Hakomori S. Genomic organization of human histo-blood group ABO genes. Glycobiology 1995;5:51-8. Yamamoto F, Clausen H, White T, Marken J, Hakomori S. Molecular genetic basis of the histo-blood group ABO system. Nature 1990;345:229-33. Olsson ML, Chester MA. Frequent occurrence of a variant O1 gene at the blood group ABO locus. Vox Sang 1996;70:26-30. Ogasawara K, Bannai M, Saitou N, Yabe R, Nakata K, Takenaka M, et al. Extensive polymorphism of ABO blood group gene: Three major lineages of the alleles for the common ABO phenotypes. Hum Genet 1996;97:777-83. Grunnet N, Steffensen R, Bennett EP, Clausen H. Evaluation of histo-blood group ABO genotyping in a Danish population: Frequency of a novel O allele defined as O2. Vox Sang 1994;67:210-5. Olsson ML, Santos SE, Guerreiro JF, Zago MA, Chester MA. Heterogeneity of the O alleles at the blood group ABO locus in Amerindians. Vox Sang 1998;74:46-50. Roubinet F, Kermarrec N, Despiau S, Apoil PA, Dugoujon JM, Blancher A. Molecular polymorphism of O alleles in five populations of different ethnic origins. Immunogenetics 2001;53:95-104. Barjas-Castro ML, Soares MC, Menezes RC, Carvalho MH, Costa FF, Saad ST. ABO blood group in Amerindians from Brazilian Amazon. Ann Hum Biol 2003;30:220-4. Henríquez H, Moraga M, Llop E, Rothhammer F. Molecular and genetic characterization of Changos descendants living in Paposo cove. Rev Med Chil 2004;132:663-72. Llop E, Henríquez H, Moraga M, Castro M, Rothhammer F. Brief communication: Molecular characterization of O alleles at the ABO locus in chilean aymara and huilliche Indians. Am J Phys Anthropol 2006;131:535-8. Seltsam A, Hallensleben M, Kollmann A, Burkhart J, Blasczyk R. Systematic analysis of the ABO gene diversity within exons 6 and 7 by PCR screening reveals new ABO alleles. Transfusion 2003;43:428-39. Wolpin BM, Kraft P, Gross M, Helzlsouer K, Bueno-de-Mesquita HB, Steplowski E, et al. Pancreatic cancer risk and ABO blood group alleles: Results from the pancreatic cancer cohort consortium. Cancer Res 2010;70:1015-23. Umbria M, Cantons J, Bruguera C, Minias A, de Duró CB, Catalano G, et al. Molecular polymorphism of the ABO blood group: A study in Poland, Spain, and Andorra. Am J Hum Biol 2014;26:556-8. Yip SP. Single-tube multiplex PCR-SSCP analysis distinguishes 7 common ABO alleles and readily identifies new alleles. Blood 2000;95:1487-92. Irshaid NM, Ramadan S, Wester ES, Olausson P, Hellberg A, Merza JY, et al. Phenotype prediction by DNA-based typing of clinically significant blood group systems in Jordanian blood donors. Vox Sang 2002;83:55-62. Yip SP, Choi PS, Lee SY, Leung KH, El-Zawahri MM, Luqmani YA. ABO blood group in Kuwaitis: Detailed allele frequency distribution and identification of novel alleles. Transfusion 2006;46:773-9. Yang BC, Zeng JQ, Yu Q, Liang YL, Su YQ, Deng ZH. Molecular polymorphism of O alleles in the Chinese Han population. Ann Clin Lab Sci 2007;37:71-4. Zhu F, Tao S, Xu X, Ying Y, Hong X, Zhu H, et al. Distribution of ABO blood group allele and identification of three novel alleles in the Chinese Han population. Vox Sang 2010;98:554-9. Lang K, Wagner I, Schöne B, Schöfl G, Birkner K, Hofmann JA, et al. ABO allele-level frequency estimation based on population-scale genotyping by next generation sequencing. BMC Genomics 2016;17:374. Mohamed AB, Hindawi SI, Al-Harthi S, Alam Q, Alam MZ, Haque A, et al. Allelic variance among ABO blood group genotypes in a population from the western region of Saudi Arabia. Blood Res 2016;51:274-8. Park G, Jang SJ, Moon DS, Park YJ, Huh JY. Rapid one-tube long PCR-sequencing for ABO genotyping from exons 2 to 7. Blood 2010;116:1116. Ray S, Gorakshakar AC, Vasantha K, Nadkarni A, Italia Y, Ghosh K. Molecular genotyping of ABO blood groups in some population groups from India. Indian J Med Res 2014;139:105-11. Cai XH, Jin S, Liu X, Shen W, Lu Q, Wang JL, et al. Molecular genetic analysis for the B subgroup revealing two novel alleles in the ABO gene. Transfusion 2008;48:2442-7. Fukumori Y, Ohnoki S, Shibata H, Nishimukai H. Suballeles of the ABO blood group system in a Japanese population. Hum Hered 1996;46:85-91. Tsai LC, Kao LG, Chang JG, Lee HH, Linacre A, Lee JC. Rapid identification of the ABO genotypes by their single-stand conformation polymorphism. Electrophoresis 2000;21:537-40. Villanea FA, Bolnick DA, Monroe C, Worl R, Cambra R, Leventhal A, et al. Brief communication: Evolution of a specific O allele (O1vG542A) supports unique ancestry of Native Americans. Am J Phys Anthropol 2013;151:649-57. Roubinet F, Despiau S, Calafell F, Jin F, Bertranpetit J, Saitou N, et al. Evolution of the O alleles of the human ABO blood group gene. Transfusion 2004;44:707-15. Anstee DJ. The relationship between blood groups and disease. Blood 2010;115:4635-43. Roychoudhury S, Roy S, Basu A, Banerjee R, Vishwanathan H, Usha Rani MV, et al. Genomic structures and population histories of linguistically distinct tribal groups of India. Hum Genet 2001;109:339-50. Basu A, Mukherjee N, Roy S, Sengupta S, Banerjee S, Chakraborty M, et al. Ethnic India: A genomic view, with special reference to peopling and structure. Genome Res 2003;13:2277-90. Bhatia HM, Rao VR. Genetic Atlas of Indian Tribes. Bombay, India: Institute of Immunohematology, Indian Council of Medical Research; 1987. p. 77. Colah R, Gorakshakar A, Nadkarni A, Phanasgaonkar S, Surve R, Sawant P, et al. Regional heterogeneity of beta-thalassemia mutations in the multi ethnic Indian population. Blood Cells Mol Dis 2009;42:241-6. Bhukhanvala D, Seliya V, Shah A, Gupte S. Study of parents of ß-thalassemia major children to determine cutoff values of hematological parameters for diagnosis of ß-thalassemia trait and assessment of anemia in them. Indian J Med Sci 2013;67:117-22. Gorakshakar AC, Das MK, Phanasgaokar SP, Nadkarni AH, Colah RB, Mohanty D. Origin of the codon 47 (+A) beta-thalassaemia mutation among the Nicobarese of the Andaman and Nicobar islands in India. Br J Haematol 2007;139:345-6. Quadros L, Ghosh K, Shetty S. A common G10430A mutation (Gly 60 Ser) in the factor IX gene describes the presence of moderate and mild hemophilia B in the majority of the Gujarati population. Ann Hematol 2007;86:377-9. Rowe JA, Opi DH, Williams TN. Blood groups and malaria: Fresh insights into pathogenesis and identification of targets for intervention. Curr Opin Hematol 2009;16:480-7. Loscertales MP, Owens S, O'Donnell J, Bunn J, Bosch-Capblanch X, Brabin BJ. ABO blood group phenotypes and Plasmodium falciparum malaria: Unlocking a pivotal mechanism. Adv Parasitol 2007;65:1-50. Lalueza-Fox C, Gigli E, de la Rasilla M, Fortea J, Rosas A, Bertranpetit J, et al. Genetic characterization of the ABO blood group in Neandertals. BMC Evol Biol 2008;8:342. Rich SM, Leendertz FH, Xu G, LeBreton M, Djoko CF, Aminake MN, et al. The origin of malignant malaria. Proc Natl Acad Sci U S A 2009;106:14902-7. Calafell F, Roubinet F, Ramírez-Soriano A, Saitou N, Bertranpetit J, Blancher A. Evolutionary dynamics of the human ABO gene. Hum Genet 2008;124:123-35.